Our homemade Italian salad dressing – a quick and easy recipe. Our homemade Italian salad dressing – a fast and easy recipe. Here’s our quick homemade Italian salad dressing. And when you've made it, browse our other easy cooking recipes – pizza, pasta, salads, cookies and more! This is a very basic but delicious salad dressing which is made from ingredients you probably already have in your store cupboards. 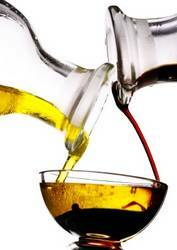 In Italy, only this season’s extra virgin olive oil is used for dressings – the first oil off the presses. But if you don’t have access to such fresh ingredients, buy the most expensive olive oil and balsamic vinegar you can afford – you’ll be amazed at the difference they make. Put the olive oil, vinegar, mustard, salt and pepper together in a medium sized bowl. Whisk by hand or use an electric blender for speed, until all the ingredients are combined. Either drizzle over a salad, or pour into a jog for everyone to help themselves. If you want a tasty meat recipe to go with your salad, why not have a look at this page about how to make Italian meatballs. Looking for something to complete your meal? Here's the most popular of Italian desserts.